The BRMAA Art Center, located in downtown Blue Ridge Georgia, offers a full spectrum of classes in a variety of mediums, and with many scheduling options to fit your schedule. Our class programming is locally grown, as we employ many talented local artists as our instructors. Call today or use the link below to see our latest classes, you are sure to find one to spark your creativity. 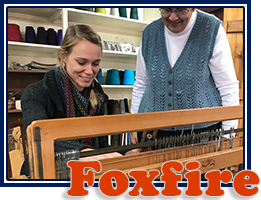 Foxfire values the preservation of cultural crafts and folk ways, and offers opportunities to share this knowledge through its Heritage Skills programs. Various Heritage Skills classes are offered spring to fall each year and teach traditional crafts and practices, such as weaving, herbal medicine, and broom making. Each course is taught on The Land by a specialist in each field. Some of our instructors come straight from the pages of The Foxfire Magazine and The Foxfire Book series. Classes for youth and adults available.